Tander Launch - Proud Craftsmen in Control! TANDER, A NEW BRAND FOR PAINT PROFESSIONALS IS LAUNCHED DURING AUTOMECHANIKA FRANKFURT (GERMANY). From 11th – 16th September Tander, a new international distributed brand developed for craftsmen worldwide working with paint in various branches, introduces itself to the market during the Automechanika 2018.
with the help of our high quality products! Coating specialists are making the difference. We believe that paint professionals have the potential to improve a business by letting their creativity run free. Therefore Tander develops and creates innovative and convenient products that help coating specialists to excel! Tander facilitates the pride of craftsmen with products that help reduce failure costs. Getting it right the first time is our aim! We strive to offer a product range that’s affordable and convenient. Quality, innovative features and an affordable price are our core principles. You will find that we offer a wide range of products in manageable packing units, accessible for everybody. We help bringing creative ideas to reality, thanks to and together with pride craftsmen! We support paint professionals around the world with innovative, high quality products that cover the complete paint process. From personal and spray booth protection to paint application products. Whether you work in industry or the automotive sector, our products are applicable to various businesses. They are used in nautical, automotive, industry, wood processing, aviation sectors and many more. 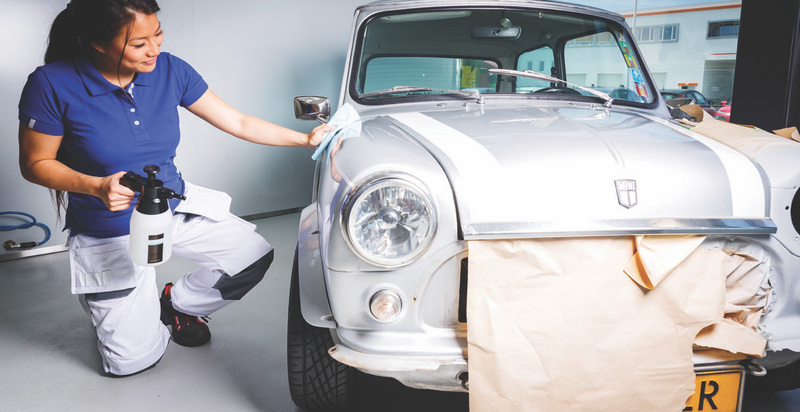 To make sure you are fully supported, we offer a wide range of products that cover the complete paint process. From basics right to the four elementary steps of the paint process, we got your back! Paint professionals know the importance of personal protection. To make sure you can continue to perform at your best, personal protection is key with products that are comfortable, convenient and, most importantly, guarantee your personal safety throughout your working day. The key to a perfect spray job is clean surroundings. Nothing is more annoying than tiny dust particles on your freshly painted surface. The booth coatings from Tander have a tacky formula that makes dust and dirt cling to the walls and floor of your booth. Start off your job with absolutely leak-free covering products that keep the protected parts safe and sound. Make sure your surface is spotless and paint proof before letting your creativity run free. Create your masterpiece with our convenient paint preparation and application products. The icing on the cake for a sublime finishing touch. WE ARE OPEN TO YOUR INPUT. IN NEED OF A SOLUTION FOR YOUR PROBLEM THAT YOU CAN’T FIND ANYWHERE ELSE? CONTACT US AND SEE WHAT WE CAN DO FOR YOU! Together we create!